Charges of Burbank Vehicular Manslaughter under California Penal Code Section 191.5(b) PC and California Penal Code Section 191.5(a) PC can be filed when someone causes a traffic collision that results in another person’s death. Both of these Code Sections require that the driver of the vehicle be impaired, however even if a driver is sober he can still be charged with a Burbank Vehicular Manslaughter offense. In these instances, Burbank Vehicular Manslaughter charges can be filed pursuant California Penal Code Section 192(c) PC. Similar to how Burbank DUI with Injury allegations may trigger felony-level charges, Burbank Vehicular Manslaughter can also be charged as a felony that carries extensive Burbank DUI Penalties. Burbank Vehicular Manslaughter While Intoxicated under California Penal Code Section 191.5(b) requires the following elements: that an intoxicated driver was involved in a collision that resulted in the death of another, that the driver drove negligently or committed a legal violation while driving, and that the negligent act or omission caused the death in question. Burbank Vehicular Manslaughter While Intoxicated is considered a “wobbler,” which means that it can be charged as a felony or a misdemeanor depending on the particular circumstances involved and the driver’s criminal history. If charged as a felony, Burbank Vehicular Manslaughter While Intoxicated penalties include prison custody time, hefty court fines and restitution to the victim’s family. Burbank Gross Vehicular Manslaughter While Intoxicated adds the additional requirement that the negligence in question be “gross.” Gross negligence is negligence that goes beyond ordinary carelessness. Someone acts in a grossly negligent manner when they engage in reckless activity that is risky to others and could cause great bodily injury. The driver additionally should have known that the driving conduct in question is considered to be risky. Burbank Gross Vehicular Manslaughter While Intoxicated is a felony-level offense that can never be charged as a misdemeanor. Driving under the influence of drugs or alcohol, without any other act or omission, is not enough to establish ordinary negligence or gross negligence under the law. There must be some additional negligent act. However, in determining whether to charge “gross negligence,” the level of intoxication is always relevant and will be closely scrutinized by prosecutors. “Great bodily injury” is defined as a serious physical injury; something that goes beyond what would be considered a minor or moderate injury. It is prosecuted as an allegation pursuant to Penal Code Section 12022.7 PC. In defining causation in Burbank Gross Vehicular Manslaughter While Intoxicated, an act causes the death of another person if the death was a direct consequence of the act, and had the act had not taken place, the death would not have occurred. A “natural and probable consequence” is something reasonably expected to occur without an intervening act. In determining whether a consequence was “natural and probable,” it is necessary to consider all of the evidence. 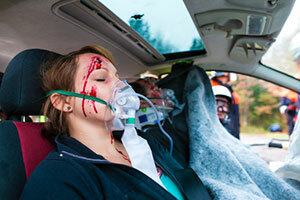 Someone injured in an automobile accident can die because of more than one act. Burbank Gross Vehicular Manslaughter charges can only apply where the defendant’s action was a substantial factor in causing the resulting death. The act or omission must go beyond a minor or trivial act. If you or a family member were in an automobile accident that resulted in another’s death, it is crucial that you contact a Burbank Vehicular Manslaughter attorney at once. Burbank Vehicular Manslaughter Attorney Michael Kraut is highly skilled at handling cases of this nature and providing his clients the best defense possible. The sooner Mr. Kraut has been retained, the sooner he and his team of investigators and experts can investigate and evaluate important evidence that may have been missed by the police. Mr. Kraut’s experts perform accident reconstructions and studies, analyze independent toxicology tests, and gather statements from favorable witnesses who may have been overlooked by investigating officers. In many cases, prosecutors and law enforcement will overfile these cases in hopes that those accused will plead quickly for state prison sentences. However, when this happens crucial exculpatory evidence may have been missed. In many instances, Mr. Kraut can intervene and consult with the district attorney before charges have been filed in order to limit or avoid criminal charges altogether. As a former deputy district attorney with over 14 years of prosecutorial experience, Mr. Kraut is highly respected throughout the court system as a knowledgeable and experienced advocate of his client’s rights. For more information about Burbank Vehicular Manslaughter, and to schedule your free consultation, contact Burbank Vehicular Manslaughter Attorney Michael Kraut at the Kraut Law Group located at 2600 West Olive Avenue, 5th Floor, Burbank, CA 91505. Mr. Kraut can be reached 24/7 at 888-334-6344 or 818-563-9810.